There is disappointingly little to report since the previous issue. At that time, I noted that we were still waiting for the report from the SAC sub-committee on sustainable moorland management. Well, we are still waiting! First there was disagreement within the committee to be resolved and now we're waiting for SNH to determine their position. Supposedly, it's due imminently, but don't hold your breath! Our parliamentary questions and possible further EU action remain on hold until this report is published. We still think that, though very frustrating, it's right to wait until the report is published. We need to be seen to be working with the national agencies rather than against them. We had a meeting at the James Hutton Institute in April with Glenn Iason and Scott Newey to understand more about their research project, in combination with the Game and Wildlife Conservancy Trust, into methods of counting mountain hares. They were friendly and very helpful. 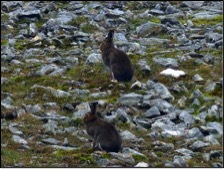 we should know how to count hares (although Adam Watson is clear that we know this already!) but we still won't have an estimate of the overall population. It looks to be something that we need to take up as part of reacting to the SAC report. We discussed the partnership with the GWCT and the potential bias that this might introduce. The GWCT is funded by the land owners and is clearly biased towards the shooting lobby. They work with gamekeepers; the same people that claim that there isn't a problem with raptor poisoning! Obviously, anything produced from/by gamekeepers is potentially much distorted. However, working with the GWCT helps enormously with access and provides data that can be correlated with other means of counting hares. Maintaining their scientific integrity is important to both Glenn and Scott and they see clearly that they need to ensure that any data used in their work is "uncontaminated". This will obviously be something to check carefully when the report is produced. We also discussed the possible use of dogs as so successfully demonstrated by Adam Watson. There are two main problems; gaining access will be more difficult and also the difficulty in finding suitably experienced people. You would be likely to end up with the requirement to use gamekeepers, with the problems described above. Finally, we discussed the issues involved in counting a population that they believe to be cyclical. This was followed by a field meeting on the 15th June, organised by SNH. Again, Glenn Iason and Scott Newey from JHI were there. Des Thompson, Rob Raynor and Fiona Cruikshank from SNH attended. Initially, we discussed issues as before; more consideration of the use of dogs, the cyclical nature of the population and the gap that will be left because the work won't come up with a population estimate. One interesting point was that there seems to be considerable circumstantial evidence that hare populations this year and last year are definitely high, despite the clear evidence from both Adam Watson's data and data from the BTO survey showing a 22% decline. We then parked at the prominent cairn on the B976 road from Crathie to Gairnshiel and walked up towards Geallaig Hill, initially along the track and then in a wide sweep off the track. The most interesting point was the large differences in hares seen scanning the hillside from the car, walking along the track and then walking in a wide sweep through the heather. It was a graphic illustration of the problems involved in counting hares. We saw none from the car, a hillwalker walking along the track would have seen one and spreading out into a wide sweep through the heather we saw over ten. In addition, it was humbling just how much more professional workers see than your average hillwalker. We hillwalkers and climbers probably all need to work on our observational skills. At the end, SNH tried to persuade Glenn and Scott to hold a seminar to both take some of the heat out of the debate (not sure if we want to be less heated!) and to build momentum for further work such as will be needed to come up with an estimate of the population size. It was an interesting and very informative meeting and I hope that plans for the seminar mature.